Bashir Bello, the SPDC’s director and general manager, Government and Business Relations, who signed the $200 million Memorandum of Understanding, MoU with the United Bank for Africa, UBA, in Abuja on Friday, March 22 described the initiative as a product of the continuous effort by SPDC and its joint venture partners – NNPC, Total and Agip – to enhance Nigerian content and local participation in the nation’s oil and gas value chain. L-R: Onyekachi Igwe, the senior government relations adviser, the SPDC; Abubakar Ahmed, the manager, Government Relations; Sarah Ajose-Adeogun, the Community Content Development manager; Bello; Morenike Akinrimisi, relationship director for Oil and Gas, UBA; and Ogbue. 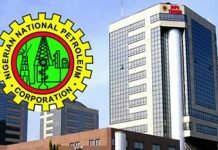 Ebele Ogbue, the general manager, Energy Bank of UBA, said the bank was committed to providing support to Nigerian companies through its partnership with SPDC JV. Ogbue, who signed the MoU for UBA, commended the Nigeria and community content efforts of Shell companies in Nigeria, noting that UBA was ready to provide the needed financial backing that would empower Nigerian companies to play more active role in the country’s energy sector and beyond.